GSC: Global Support Center - JGA, Inc.
JGA's Global Support Center (GSC) is a completely secure and customizable Internet-based application that streamlines technical support. GSC is distinct from most commercial help desk applications in that it complies with all Department of Defense (DoD) standards and restrictions for code and architecture, and supports a wide variety of DoD hardware and software. The Global Support Center is a simple but powerful application that makes it easy and significantly more efficient to track and resolve reported problems. GSC users can effectively search a database for a resolution to their problem, or submit the problem for evaluation and resolution by a subject matter expert. GSC instantly alerts all necessary support contacts regardless of their location. Once implemented, these systems will allow your organization’s support groups to run smoothly and efficiently. 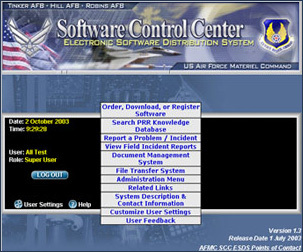 Our systems are currently implemented in several DoD organizations around the world. These systems, combined with our support team, will take your organization’s hardware/software support staff to new levels. JGA is at the forefront in addressing the DoD’s/Government’s requirements, restrictions, and needs. We are constantly leveraging and positioning ourselves to implement new technologies as they become available.